For five decades, we have had the honour of playing a unique role in the intellectual life of British Columbia. 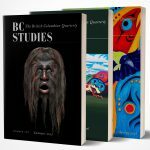 Since 1969, BC Studies has been an important publishing venue of original research from a diverse group of scholars, as well as a training ground for students. Thank you to everyone who has supported us over the past 50 years. Stay tuned for the publication of our SPECIAL 50th Anniversary Issue!